Arsenal rounded off their campaign in style to become the first side to go through a league season unbeaten since Preston achieved the feat in 1888/89. Leicester threatened to stop Arsenal entering the history books when Paul Dickov headed home after 25 minutes. But Thierry Henry settled Arsenal's nerves with a penalty a minute after half-time following Frank Sinclair's clumsy foul on Ashley Cole. Patrick Vieira made it an invincible season with a 66th minute winner. Highbury was in party mood even before kick-off, and Freddie Ljungberg almost sparked early celebrations when he pulled a shot just wide after eight minutes. Henry then forced a fine save out of Leicester goalkeeper Ian Walker when he tipped over a 25-yard free-kick. But Leicester were working tirelessly, retaining possession and getting players behind the ball to deny Arsenal space. And as their confidence grew, Leicester stunned Arsenal by taking the lead after 25 minutes. Sinclair's cross found Dickov unmarked at the far post, and as Jens Lehmann hesitated he headed home. Arsenal, their record under threat, pressed forward and Walker did well to hold a stinging drive from Robert Pires. But Leicester's resistance was broken a minute after the break when Henry equalised from the spot. He sent Walker the wrong way after Sinclair had clumsily hauled down Ashley Cole. And the record was in touching distance after 66 minutes when Bergkamp unlocked Leicester's defence with a moment of brilliance. He provided the slide-rule pass for Vieira, who escaped from Freund to round Walker and score. Martin Keown came on as a substitute to ensure he has enough appearances to earn a championship medal - then the final whistle went to ensure the Gunners took their place in history. 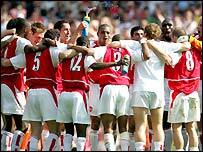 Arsenal: Lehmann, Lauren, Toure, Campbell, Cole, Ljungberg (Keown 87), Silva, Vieira, Pires (Edu 70), Bergkamp (Reyes 82), Henry. Subs Not Used: Parlour, Stack. Leicester: Walker (Coyne 78), Sinclair, Heath, Dabizas, Stewart, Scowcroft, Freund (Brooker 76), McKinlay, Nalis, Bent, Dickov (Benjamin 85). Subs Not Used: Gillespie, Guppy. "This record is good for the Premiership because it sets a new benchmark"
What were the decisive games in Arsenal's season?